Donations provide important support to the Lake Bluff History Museum. Your financial contribution is critical to keeping the spirit and history of Lake Bluff alive through the programs, exhibits, museum collection, research, website and newsletters produced by volunteers who contribute countless hours of time to make these a reality. 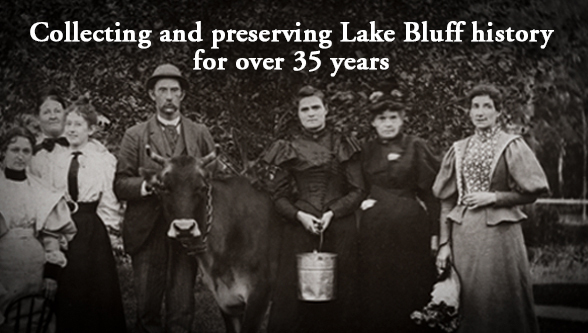 Thank you for bringing Lake Bluff History to life by giving! Without your help, none of this would be possible. The Lake Bluff History Museum, operated by the Vliet Center for Lake Bluff History, is a 501(c)(3) non-profit organization. All gifts are tax deductible to the extent provided by the law. A commemorative brick, personalized with your message, will be added to the museum "garden" for a donation of $100 or more. The net proceeds of your donation will be divided equally between the Lake Bluff History Museum and Friends of the Library. Your commemorative brick will be imprinted with your message and installed in a special area outside the Lake Bluff History Museum. Please use the boxes provided below for your message. Print the message in capital letters, exactly how you want it to appear on the brick. There is a limit of 3 lines per brick, with a maximum of 13 characters per line.